MTY Food Group (MTY) has recently announced another acquisition with the addition of the franchise Café Dépôt, Sushi Man, Muffin Plus and Fabrika. This acquisition adds 102 stores to their current collection of stores. The acquisition is a small one but strategic since it strengthen MTY’s position on the food court. Except for your McDonalds’s of this world, there isn’t much that MTY doesn’t own at your local mall’s food court (Canada). The transaction is a welcoming one and comes from directly from Stanley Ma’s playbook. However something else has caught my attention and that is the spike in volume the day before the press release. Daily volume before the transaction clocked in at 160.9k shares, which is 6.5 times its daily average. 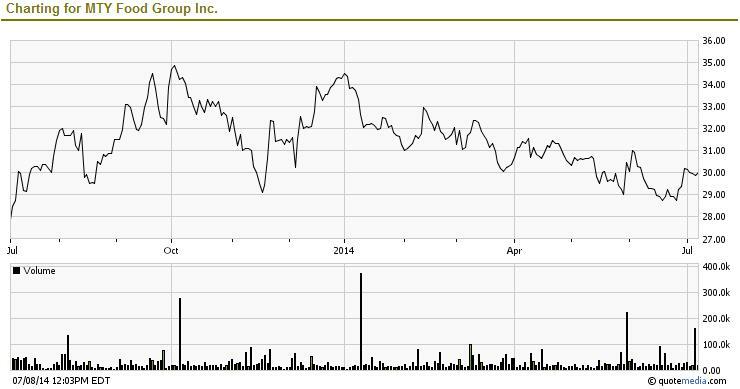 MTY is considered a small cap sleepy stock. It might be a coincidence, but it smells like a leak. Unfortunately I don’t have data on who is the buyer or buyers are. The chart below is a one-year chart of MTY’s price and volume history. You can see that daily volume over 100k is pretty rare and occurred five times in the last year. 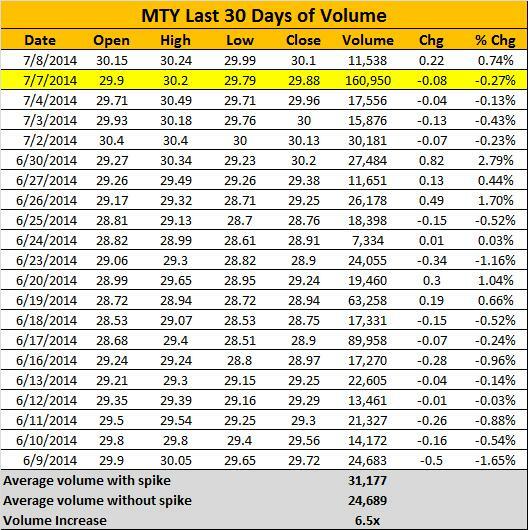 Here’s is a table of the price and volume of MTY in the last thirty days. Leaks are frequent before announcements. There are a lot of people involved in the numbers and it’s almost inevitable that some info gets leaked out. I have seen MTY trend downward days before a disappointed quarter and upward days before announcing a good quarter. All of this is speculation since I rely on observation instead of hard evidence. Q2 numbers are expected soon and MTY has been trending upward, is that an indication of good numbers to come? Cute video that’s going around the Internet. Since moving to our new place I have been looking at getting a dog. Below is a video of a dog freaking out for getting so many balls.